Pastor George M. Sharps gave his life to the Lord in 1988. He diligently studied the Word of God under the teaching of the late Pastor Samuel P. Callahan of Christ is the Answer Full Gospel Church. 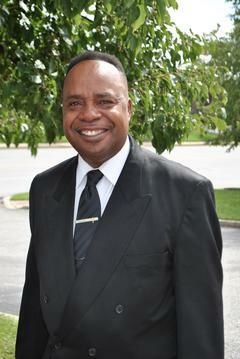 Pastor Sharps has a desire to serve and be obedient to the Word of God and the Holy Spirit. In 1990, his love for Jesus and the Kingdom of God led Pastor Sharps to be ordained as a Deacon. The Lord said “those who humble themselves shall be exalted”, and the Lord did just what he said. As Pastor Sharps continued to live faithfully under God’s calling, the Lord continued to elevate him. In 1999 Pastor Sharps was ordained as a Minister and in 2002, under the leadership of Pastor Arthur Lewis, he became the first Assistant Pastor of Christ is the Answer Full Gospel Church. As Pastor Sharps remained steadfast in obedience to Christ and meditated on scripture, God continued speaking into his heart. God constantly reminded Pastor Sharps of the message in Proverbs 3:5-6, “Trust in the Lord with all thine heart and lean not unto thine own understanding. In all thy ways acknowledge Him, and He shall direct thy path.” After much prayer and seeking the Lord he knew God was directing him to pastor his own church. On December 5, 2004, Pastor Sharps, under the guidance of the Holy Spirit, founded Jesus Lives Ministry Fellowship, where he teaches and preaches the uncompromised Word of God through the love of Christ that rests within him. It is the Word of God rather than the word of men that ultimately directs Jesus Lives Ministry. Pastor Sharps is the son of Mrs. Annie Sharps and the late Daniel Sharps. He is married to his lifelong companion, LaTandria Wallace Sharps. They have two sons, Pastor Tanardo Sharps and Darontay Sharps, two daughter-in-laws, Evelyn and Charlene Sharps, and 7 joyous grandchildren. Pastor Sharps worked for the Maryland Department of Transportation State Highway Administration (SHA) for 31 years. As in ministry, his submission to Christ also resulted in Pastor Sharps being elevated on his job. During his tenor with the SHA, Pastor Sharps worked as a Team Leader, Tech Manager and a Residence Maintenance Engineer. In 2007 he followed God’s direction and retired from the SHA in order to devote his time to ministry. Pastor Sharps now works exclusively for the Kingdom of God as a servant of Jesus Christ. To God be the Glory!